“Start paddling!” the guy calls out from behind me. I rotate my arms as fast as I can, digging into the water as I feel it start to lift and push me forward. “Now get up!” he shouts, so I can hear him above the roar around me. I don’t have time to think. I bring my hands closer together, palms flat, as if beginning a yoga sun salutation. Then I push up quickly and swing my left leg and foot under me into a lunge. My right foot scrapes forward a few inches on the sand papery surface and I plant it flat as well. I know I need to let go and straighten my legs, to get my weight back so that the nose stays up. But it’s like standing on a horse, the weight of the water shifts under me as I unbend and that’s when the board bucks, its tail flicking me forward and its head dipping down. There’s no saddle for me to hold onto, so I aim for a soft spot to land, protecting my head with my hands in case my ride lands on top of me. And then I hold my breath. I’ve fallen a lot in my life. Off skateboards, stilts, a unicycle, skis for both water and snow, a particularly tricky pogo stick, and a windsurfer I never really got the hang of. My more memorable falls have included a horse in France, a wipeout off my ten speed coming a little too quickly down a long hill with a guy I had a crush on, and another one at Wildcat Mountain in New Hampshire, causing many tears when I experienced my first fracture–snapping a ski in two. As many times as I’ve fallen, I’ve almost always gotten back up, even when it took me a summer’s worth of swallowing water behind a speedboat before I could straighten my legs, lean back, and let the boat pull me up and around the lake on waterskis. By the next summer, I was dropping one ski and jumping off the wake on the other, to slalom the smooth glass-like surface beside it. Admittedly, many of the falls I’ve taken, I took as a kid. I was developing my balance, gaining technique, but I think I was also learning to fall, realizing that a certain amount of discomfort, even pain, could lead to a much greater pleasure. An all day hike up a boulder strewn trail would reveal the most amazing sunset and an apple that tasted better than any other on earth. A mile long swim at dawn on a lake in Vermont began with the reveille of loons and ended with hot cocoa and the first feelings of elation. A cold night under a sleeping bag on top of a floor made of ice that slowly melted gave way to a brilliantly sharp blue sky day in Tuckerman Ravine, before skiing the rest of the way down Mt. Washington. I probably fell once or twice or more, but who remembers that in light of such fun? Does a childhood of learning to fall become an adulthood of appreciating adventure? Does the labored breath, the burning pain of well-used muscle, the sweat on your brow and back and neck become something looked forward to? Obviously, there are favorable chemical and biological reactions at play, but if we don’t develop a taste for them early then is it harder to find the energy and impetus to seek them out later? For instance . . . there is a mile long hill not far from my farmhouse in the valley. I often ride my bike on the road along the creek with its gradual gentle rise. The exertion is minimal and the views are bucolic, framed by forest. If I cross the creek and turn up the hill, I have to shift into my lowest gear, stand up on my pedals, and grind everything I’ve physically got into getting to the top. But fifteen, twenty minutes later, four or five times longer than a valley mile, I am looking out over a thousand shades of green. The view is my apple on top of the mountain. It’s been a while since I’ve fallen off my bike, or on the ski slope, or from a horse. But remembering what it feels like hasn’t dissuaded me, it’s only encouraged me . . . to find a new way to fall. I see the long white board a few swells in front of me and swim over to it before it reaches the beach. I turn it around, flop back on, and head out again, arching my back when a wave crests in front of me. It’s tiring to get beyond the break, my shoulder muscles burn, but a ride down a hill, whether of earth or water, is more satisfying when you’ve climbed to the top. My instructor spots the next wave and I paddle to meet it. But this time as I start my sun salutation, I think with my feet and my legs instead of my head. I feel the wave and my right leg knows to add more weight. My knees loosen to feel the water. I’m not just standing; I’m moving upright along with the wave. Suddenly I’m aware of the rest of the world around me . . . the long stretch of beach, the shorebirds flying in a V down the coast toward Rincon Point, the sun finally burning through the early summer fog. Who knew that something so simple as moving with the speed of water could bring such joy? Possibly a kid with skinned knees jumping on a pogo stick. 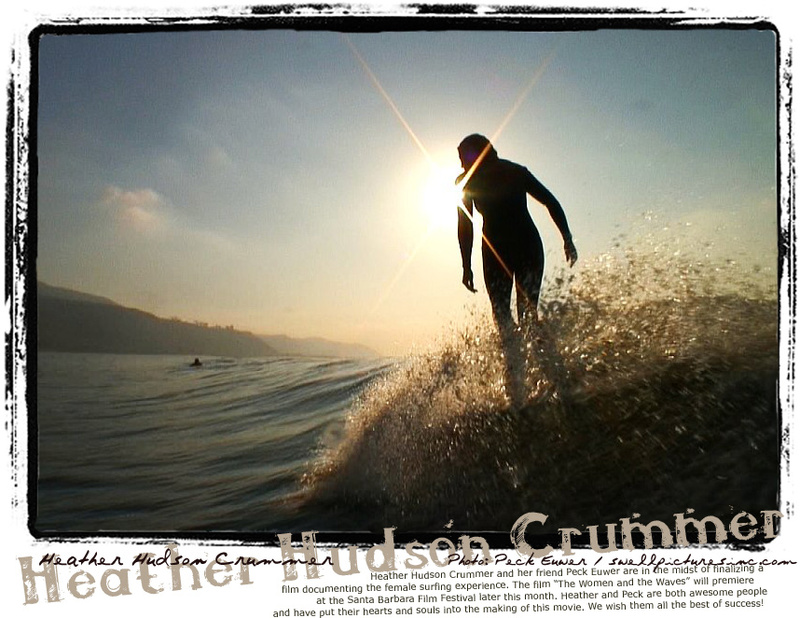 This article was inspired by three heavenly days just south of Santa Barbara in June. I was on my own, so I did exactly what I liked and southern California is a great place to do that if you love hill hikes and beach excursions, as I do. The most fortunate choice I made was to bunk at a b&b in Montecito, minutes from both beach and hiking trails. While Santa Barbara is beautiful and seemingly a shoppers, strollers, restaurant goers paradise, I preferred being slightly off the beaten path and just trekking in for dinner. Here are a few of the places I patronized while in the area. Vince’s Coffee Shop– I lucked into finding this place while taking an interior route from LAX to Santa Barbara and got hungry watching all the orange groves go by on route 126. Vince’s is on the main drag in Santa Paula, CA and has a few plastic tables out front under an awning and some hanging pink petunias. But it was the sign that got me — huevos rancheros with home-made chile verde. I didn’t get there in time for the $5.99 breakfast special. But it was still more than worth it for a few bucks more. 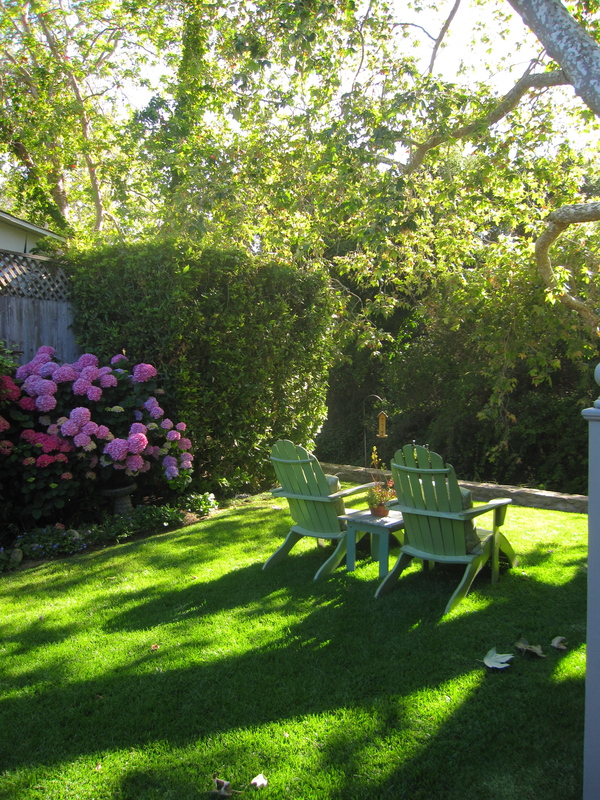 Creekside Montecito B&B – I love b&bs, but I hate how many of them are frilly, flowery, and decorated as if the Queen is coming for tea; I’ll take a Motel 6 over those. But Creekside fit me to a T with its treehouse feel, private porch for reading, and outfitted by an owner who clearly loves art, music, and books. And the large living space has a couch for curling up on, a TV/DVD if you’re not a book reader, Bose sound system with plenty of CDs to play, and a little kitchenette to make your coffee and warm your muffin in the morning. It’s such a little haven that I was tempted to stay there all day, but lovely Miramar beach is less than five minutes walk down the road, hiking trails pepper the hills a short drive away, and Santa Barbara is just a few exits up the coast. I would’ve stayed there all summer if I could’ve afforded it. Arch Rock Fish – Santa Barbara is rife with restaurants and bars, but I liked that this mostly seafood restaurant was a few blocks away from State Street, the busy main drag. It was lively, but not deafening, and had a bar that I could comfortably eat at, along with my happy hour drinks (tip: happy hour lasts all evening on tuesdays!). Appetizers were good, but didn’t outdo anything I enjoy in New York. However, I would go back for the sweet and salty miso cod with baby bok choy. Inspiration Point – Just one of many hiking destinations. This one is just above the Botanic Gardens in Santa Barbara and an easy hour or so of hiking up the Jesusita Trail to a satisfying, if not inspiring, view of the coast and the mountains. Brophy Brothers Clam Bar – Overlooking the Santa Barbara harbor. Extremely popular for its fresh fresh seafood and casual, convivial atmosphere. No reservations, so you can wait quite a while for a table, but the bar is first come first served and I was able to slip into a single seat. 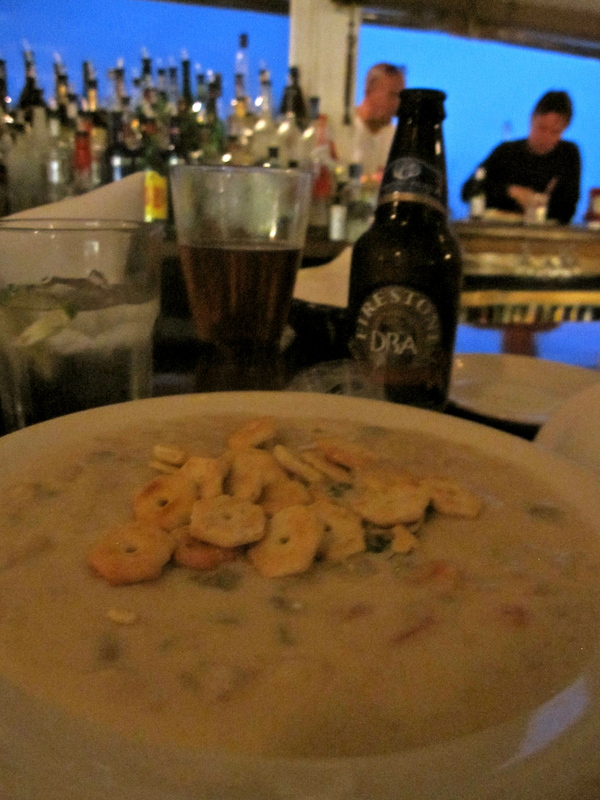 I had a local Firestone DBA brew and Brophy’s famous new england clam chowder. Then a half dozen oysters. Almost felt like I was back home in Bahston…. A-Frame Surf Shop – Basically, the guys (and one girl) at A-Frame made my vacation, just by being so friendly, accommodating, and encouraging. I walked in at noon without a clue, they put me on the list for a private lesson, called me back a few hours later, and I was on a longboard by three. Here’s a great video clip of what my instructor, pro-surfer Adam Lambert, can do on a board. I may need a few more lessons…. This entry was posted in squash and tagged surfing. Bookmark the permalink. Hey Tracy, as long as you didn’t have any shark encounters………all’s well!! Well put, i just had the surfing experience for the first time and I second that emotion.